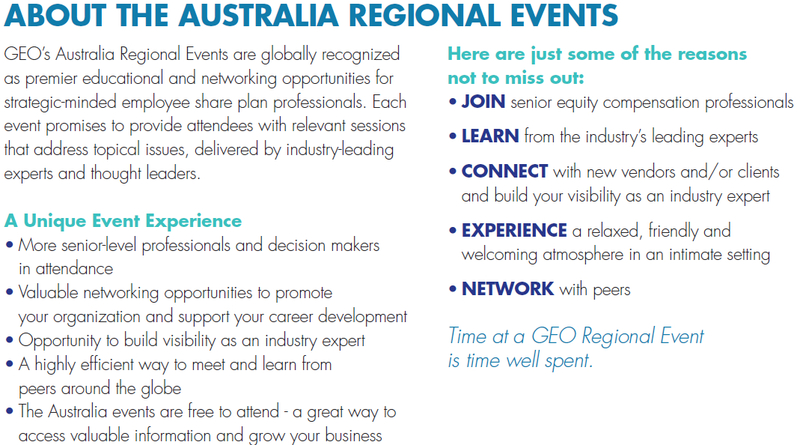 GEO was delighted to present the 2014 Australia Regional events— dedicated to Australian equity compensation in Sydney on 14 October and Melbourne on 16 October. 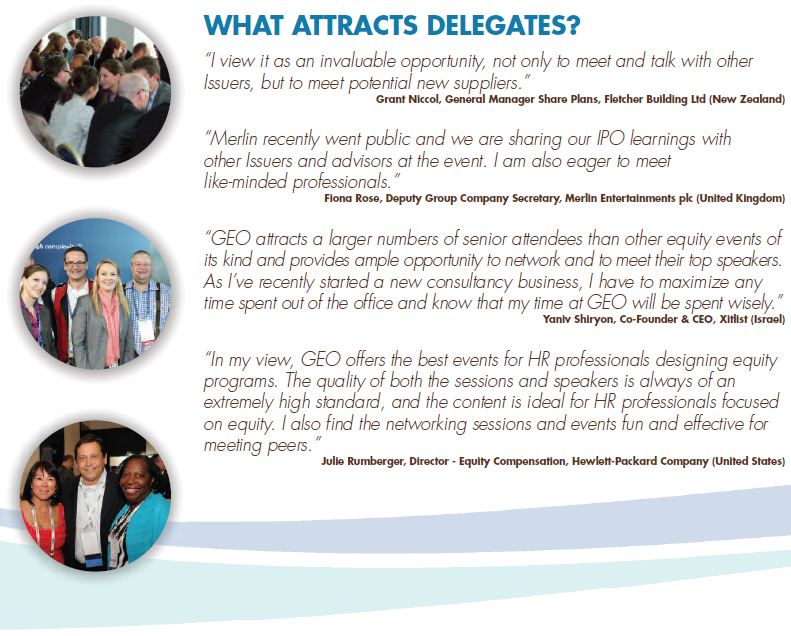 When one just isn’t enough—attend this session and hear the findings of important research from two different firms. First, get an in depth look at the findings from research by the London School of Economics, commissioned by Computershare, on how broad-based employee share plans can influence employees and be a valuable contributor to a company’s success. Panelists will show how offering a plan can make a significant difference to workforce performance, e.g., employees who take part in company share plans work longer hours, take less absence and are less likely to leave. Next hear the key findings from EY’s global share plan survey, which offers insights on current global market trends of global equity plans, including broad-based schemes and executive long-term incentive plans. Establishing and maintaining employee share plans is complicated. An issuer needs to juggle many things, e.g., how the ATO will treat the plan from the perspective of the employee as well as the issuer, compliance with the regulatory guidance from ASIC and the advice that is being received from advisors. To add to this complication, the goalposts seem to keep shifting. It can be difficult to understand what the proposed and / or implemented changes mean in practice and how they will apply in the real world, to the specific plan and circumstance of the issuer. This session aims to provide a practical perspective of what you should pay attention to when establishing a trust, or maintaining your current trust and plan. Following the 2009 tax changes, a number of companies ceased operating their broad-based employee share plans. This was partly due to the claw-back of the tax concessions available under certain broad-based plans and also the uncertainly surrounding the impact of the tax changes on these types of plans. But there has been renewed interest in broad-based employee share plans. A recent trend has been for companies to look at plans which may not receive concessional tax treatment, but that meet the desired objectives and are easier to administer, particularly from a global perspective. This session will explore the issues that some organisations have recently considered when looking to implementing a new broad-based employee share plan. Hear first hand from one of the key players in the Government driving the proposed employee share plan reforms. The session will look at the options being considered by the Government, particularly how the 2009 tax rules will be dealt with, and whether the changes will address broader reforms to the regulatory landscape.